Fabrication & Installation Services is one of the business units of Nutec Bickley, a group with a presence in more than 50 countries. FIS was established at the Monterrey headquarters in 2014. It has grown rapidly and already accounts for nearly 20% of Nutec Bickley sales revenue. 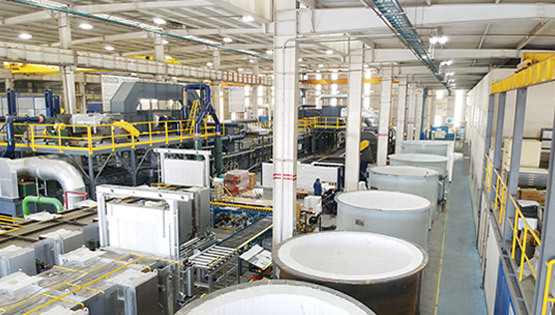 At the state-of-the-art fabrication facility in Monterrey, Nutec Bickley preassembles its furnaces and kilns, either completely (intermittent/batch) or in modules (tunnel). This policy has many benefits, not least that down the line – during the installation and commissioning phases – everything is smoother, quicker and more effective, leading to proven benefits for all our customers. 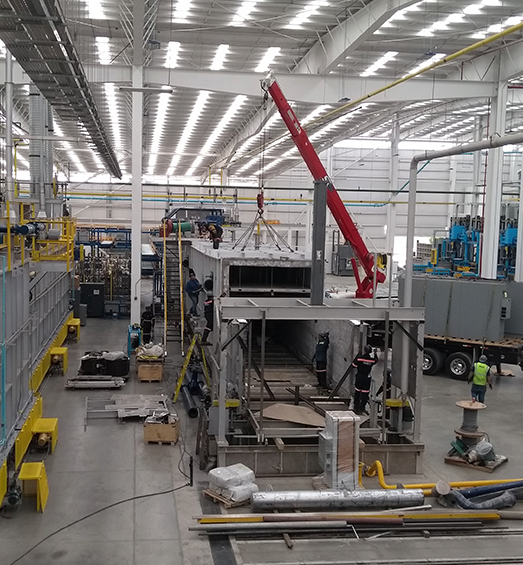 During the manufacturing process we maintain an open dialogue with all customers, sharing test information, and we encourage representatives to visit our Monterrey site to follow the progress of their project. They can see our highly experienced operatives, modern fabrication facilities, quality assurance procedures, and also how we optimize all system components before shipping. 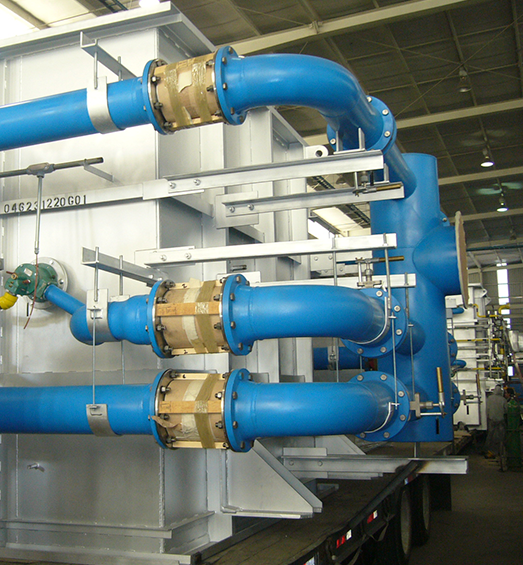 We provide sub-contract work for companies looking for manufacturing of installing Heat Treating related equipment. Project Overview: Year 2017-2018. Fabrication of 25 modular sections of a continuous galvanizing furnace line. Preheating and Radiant Tubes Heating Sections. The project scope included all steel works, supply and install of insulation material, including inner sheets and mechanical assembly of radiant tubes and all casing accessories. Supply of NUTEC insulation materials products. Steel casing: weight around 186 metric tons – including ASTM A36 and high temperature resistance stainless steel components. Manpower deployed: approximately 60,000 man hours. Around 30,000 for insulation and assembly work. Project Overview: Year 2009-2010. Fabrication of 36 modular sections of a continuous galvanizing furnace line. The project scope included all steel works, supply and install of insulation material and mechanical assembly of radiant tubes, all combustion pipework relating to the air, gas and protective atmosphere piping system, as well as electrical workshop prewiring of furnace sections. Refractory installation, including brick floors and castable refractory sections. Steel casing weight: around 210 metric tons – including ASTM A36 and high temperature resistance stainless steel components. Manpower deployed for insulation, mechanical assembly and pipeworks: approximately 40,000 man hours for insulation, assembly and pipe works. 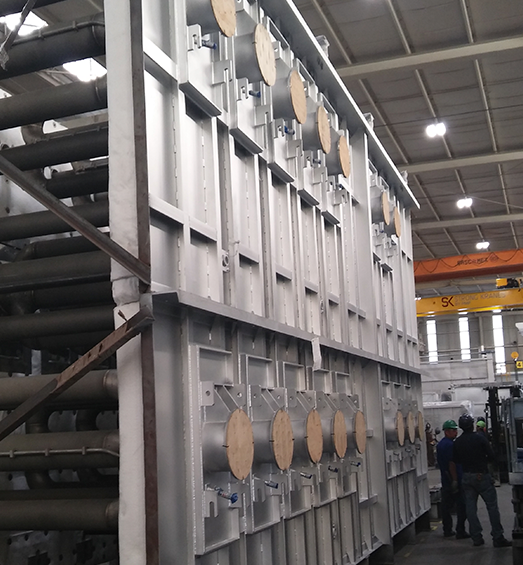 Project Overview: Contract for the complete manufacture and on-site installation of two continuous heat-treat solution lines for aluminum wheels to be installed at Tijuana BC, México. These new lines will complete four lines for this customer for whom Nutec Bickley’s Fabrication & Installations Division has become a long-term partner for more than six years – fabricating and installing their capital equipment projects. 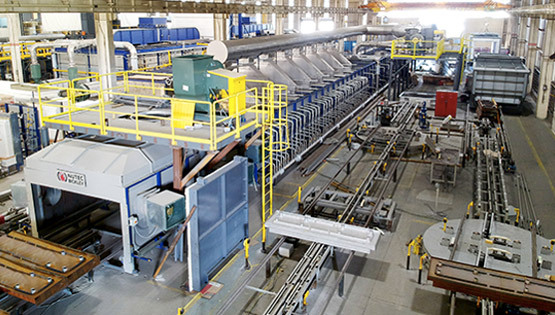 Each heat treatment line includes solution heat-treat furnace, water quenching system, aging oven, cooling hoods and conveyor handling system. Greenfield project – new plant. Total length of line per HT line: 80 meters (260 feet). Steel casing weight per HT line: 133 metric tons – including ASTM A36 and AISI 304 steel material. Manpower deployed for fabrication of the two lines: approximately 70,000 man hours. Manpower deployed for site installation for the two lines: approximately 15,000 man hours. To date, these highly successful projects have been characterized by meeting the needs of European and American industrial design groups and OEMs where high-labor demand is expected. 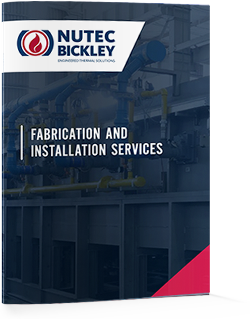 All manufacturing services take place in Nutec Bickley’s 8,000m2 state-of-the-art fabrication facilities in Mexico, for major installation projects in Mexico itself and across North America. The company is planning to expand its steel fabrication capacity from 720MT to 2,500MT per annum. Many Foreign Original Equipment Manufactures (OEM) and Industrial Companies rely on Nutec Bickley manufacturing reputation and experience, to fabricate and install their industrial equipment. European OEMSInstallation of industrial equipment in USA.